This multi-coloured effect light creates mind-blowing, rotating beams with an array of red, green and blue LEDs. The motor motion creates ever-changing effects. 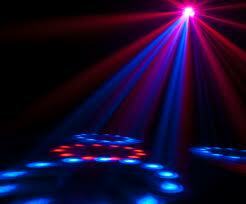 Awesome sound-activated programs allow it to dance to the beat of the music.